As we celebrate Independence Day, we should recognize that millions of our ancestors, by their creative thinking, hard work, devotion to the common good, and personal sacrifices have helped make our nation a beacon of democracy and opportunity in a world that has faced a sea of challenges since 1776. 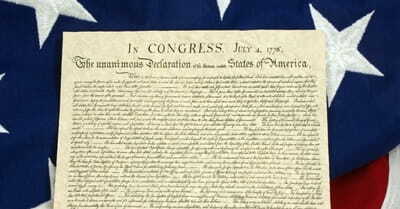 Is the Declaration of Independence Christian? Does it Matter? Religion is something that is not only meant to be held closely within one's thoughts, but which people should have the freedom to live out in every sphere of life. How is it that the Constitution has endured with only a few amendments? Christians must graciously but unflinchingly use the legal tools at our disposal to oppose these measures. Not to do so is to acquiesce to Christophobia, which no Christian nor any American should ever do. Shouldn't a Documentary About History Be Historically Accurate? I suspect that those who see actor Kirk Cameron's documentary Monumental will be entertained, but will they be educated?